Nature is teeming with them: spirits in the earth, in crystals, in water, in the air, in fire, clouds, trees; in everything that is present on this earth and in the cosmos. They are all around us, all the time, creating a beautiful world. Sound creates not only physical pressure waves through the air, but also creates subtle waves in the spiritual realms. When singing bowls are played, their sounds resonate on the spiritual level for many miles around. Nature spirits hear this and are attracted by it. During one of my hour long group sessions a thunderstorm came over. As I could not avert this unexpected intrusion of sounds, I tuned into it and incorporated the thunder sounds in my playing. The thunder beings were aware of the singing bowls session as they came closer and closer, and we even got a lightning strike very close by. They must have been blessing the session because after the session the participants were delighted, and called it the best session they had ever had. So, you see it pays of to take the spirit beings into account and have respect for them. 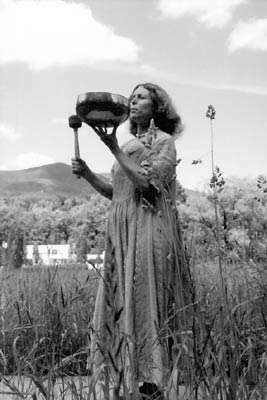 My wife Carol often goes out into the meadow and sends out the sound of the singing bowls to the environment. She does this regularly, and the birds in the neighborhood love it. The more you do it, the more a resonance in the area is established, bringing peace and harmony there. It is nice to take your bowl out and play it on special times, times set aside for worldwide peace meditations, times of stress and fear, times of celebration and joy. Your intentions count, think of all the other people around the world who need love and healing, and think of all the others who are collectively contributing their energy to helping.